Pathetic, childish, and illegal (not that it matters to the wimp Republicans. Rules are not made for these people, just you and me). Rep. Ted Poe, R-Texas, attempted to gavel the House into order at noon, but when the Democrats refused to quiet, he gaveled the House into recess instead. House Minority Whip Rep. Steny Hoyer, D-Md., suggested early on that could be a marathon recess, and Democrats continued to hold the floor long into the evening. "Our people deserve to know where their representatives stand on this issue, just as they now do with their senators," Hoyer said. "Led by civil rights hero Rep. John Lewis, we will be sitting-in until the House is allowed an opportunity to vote. This is an issue that ought to transcend party — it's about saving lives and keeping our communities safe." More than six hours after the sit-in began, Ryan said on CNN he would not schedule a vote on bills that have already been defeated in the Senate. "This is a publicity stunt," Ryan said. "This isn't trying to come up with a solution to a problem. This is trying to get attention." 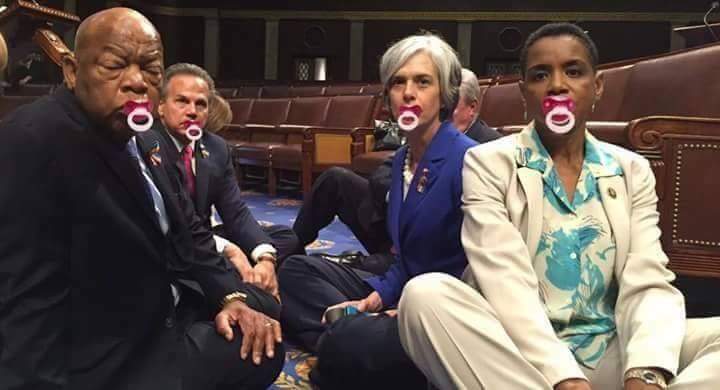 (Breitabrt) – Members of the House Republican Conference are furious at Speaker Paul D. Ryan (R.-Wis.) after they were forced to sidelines for more than nine hours while House Democrats staged a college-style sit-in in the House chamber to demand restrictions on gun rights. 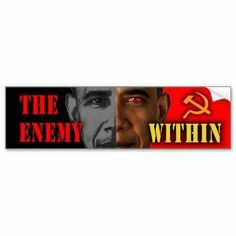 “Ryan was so weak, he just let them take over,” a Capitol Hill source told Breitbart News. The speaker and other members of his leadership team were off Capitol Hill, when the protest began because he was scheduled to make remarks at the American Enterprise Institute, where he shared his plans for healthcare reform in 2017. “Nobody locked the doors, nobody shut off the lights and nobody did anything to keep food off the floor or to keep people from coming and going,” the source said. Sen. Elizabeth Warren (D.-Mass.) brought doughnuts and coffee to her House colleagues, including Rep. John Lewis (D.-Ga.). The House was gaveled out of session, so the feed to C-SPAN was cut from the control board in the House Recording Studio. 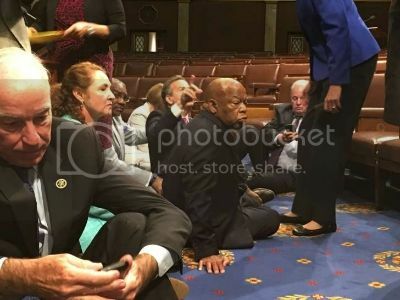 House But Democrats have live-streamed their protest using Periscope, a social media platform owned by Twitter — even though the use of Periscope is also against House rules. The source said none of the GOP members wanted arrests. 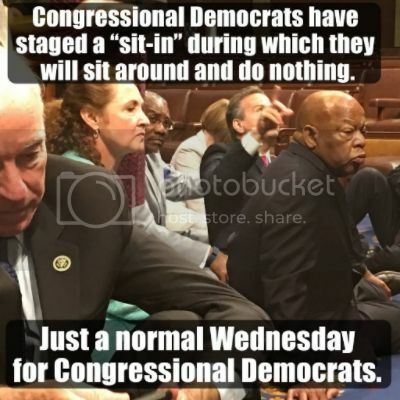 But Ryan should done something to end the sit-in, short of having people forcibly removed. In 2008, Republicans protested when Democrats, led by then-Speaker Nancy Pelosi (D.-Calif.), adjourned the House without granting a floor vote on offshore drilling. When Republicans then refused to leave the House floor, Pelosi ordered the lights and microphones off and cut off the video and audio feed to C-SPAN. When reporters refused to leave the House Press Gallery, where they were watching the action, Pelosi order the Capitol Hill Police to remove the reporters from the gallery. Ryan has got to go. The timing of this 'temper tantrum' reminds me of Rahm Emanuel's advice, "You never let a serious crisis go to waste"
You might as well get some laughs out of the disgraceful conduct of your Congresscritters.